I was in my junior year of college when I first saw a human cadaver. A person had graciously donated their body so that we students could study and learn from it. The way we studied the body was by organizing the organs, bones, and other components into functional systems. One of these systems was the nervous system, and at the end of the semester I held a human brain in my hands. It seemed impossible that an organ mostly composed of fat could be responsible for a person’s entire being. Within this grey lump were billions of cells that together possessed the ability to contemplate the universe. Our bodies are composed of many different types of cells all specialized to perform specific tasks. These cells move around our bodies with their own agendas and act without our knowledge or control. For example, red blood cells journey to all parts of the body and deliver oxygen to our tissues independent of our conscious mind. However, at the most basic level, these cells are still ‘us’. The thought that these cells were not only a part of me, but that they knew my own body better than I did was overwhelming. I imagined my brain in the context of one cell among many in the body of the universe and was astounded. I was reminded of Carl Sagan’s famous quote: “We are a way for the universe to know itself.” I had seen the brain in a new light, and now I wanted to explore it. 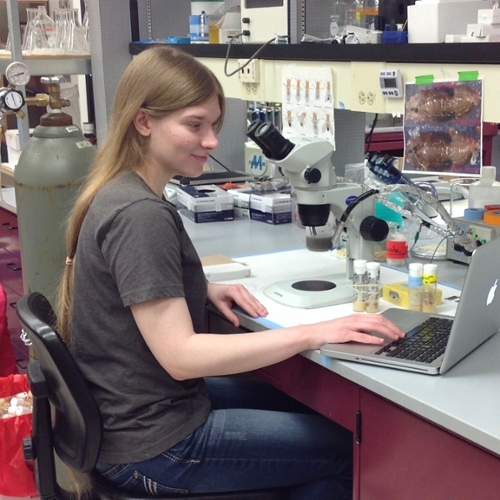 I got the chance to investigate my new interest when the University of Montana launched its Neuroscience Program. The Neuroscience Program at UM offers students the chance to study the brain at either the level of cells and molecules or cognition and behavior. I was a Human Biology major at the time and chose the cellular and molecular option. The new classes were, to my delight, all hyper-focused on the brain. The class material went deeper and was more complex than anything I had studied before. I was ecstatic. Summer came, and I volunteered to help in one of my professor’s labs. I found myself exploring the brain with other neuroscientists and pursuing questions and developing experimental techniques through my own research project. My project involves studying the brain using fruit flies. Fruit flies and humans share about 60-75% of their genes and produce many proteins that are similar and perform the same functions. For instance, in both fruit flies and humans, the enzyme acetylcholinesterase works the same way to break down the chemical acetylcholine. Fruit flies and humans also share similar behaviors. One example is aggression. 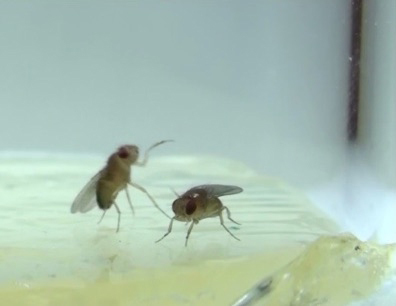 Fruit flies must fight for mates and resources, and aggression is critical to success. 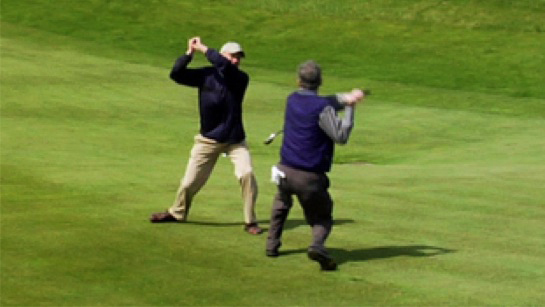 Aggression is more than a behavior; it is a complex process involving signals from the environment and culminates in a response. First, the information from the environment is detected by the sensory portion of the nervous system. Secondly, this information is decoded by the brain, and finally an appropriate response is generated that takes the form of an aggressive action. Processes like aggression are organized into circuits within the brain. These circuits are activated or suppressed at the molecular level by special chemicals called neurotransmitters that are exchanged between the cells of the brain called neurons. Neurotransmitters are important for communication between neurons and can cause them to act differently depending on how much neurotransmitter is released. In diseases like schizophrenia, too much neurotransmitter called dopamine is released, and the results are changes in memory and language. Conversely, in Parkinson’s disease, too little dopamine is released, and the results are muscle tremors and cognitive decay. My research project focuses on how male fruit flies behave when another one of these neurotransmitters, glutamate, is present in the nervous system in excess amounts. How does glutamate influence aggression in fruit flies? Does it cause fruit flies to be more or less aggressive? What does this mean for glutamate and human aggression? I don’t know, but I can’t wait to find out. As a student in the Neuroscience Program, I am exploring a subject that fascinates me – the brain and the chemicals that make it work. I am becoming a scientist seeking answers to questions and learning experimental techniques. I hope to go forward with my newfound interests and skills to better understand myself, my brain, and my universe.